You knew he was going to do this eventually…. Of course I was going to do a Tiki version of a Pegu eventually. But it was a considerably harder challenge than it looked at first blush. To begin with, the Pegu isn’t a very Tiki-like drink. It’s a classic, three (four) ingredient gin sour, strained, and served in a cocktail glass with a wedge. That’s too simple a recipe, presented and garnished too plainly, without any ice to play with. It simply doesn’t look, feel. or taste very Tiki. And I couldn’t just throw a normal Pegu in a monkey skull mug and call it a day either. If you are going to screw around with perfection needlessly, you need to be over the top about it. Especially when you are going Tiki, the official standard bearer of Over The Top among classic cocktails. First, I decided to make my Pegu-Pegu a blender drink, and whip it smooth while I was at it. This ended up being hugely problematical, but when I made the decision, I was just thinking style. For the garnish, I went for a full-on, mulit-part constructed thingy that even Rick might appreciate. I started with my favorite tattooed lime wedge (already pretty elaborate looking), added a second, and sandwiched a cherry in between on a toothpick. You need to notch the lime wedges after you stick them together, at an angle, and off-center so that the toothpick can rest on the rim of the glass and support the weight. I decided to keep the cocktail glass, as homage for the original and because the new garnish sat best on it. 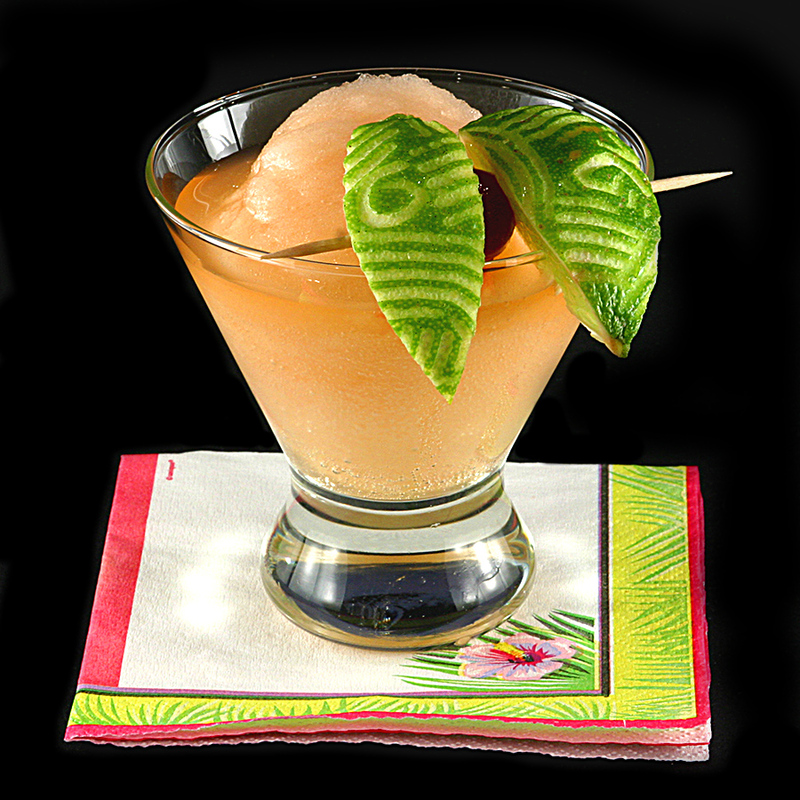 As for the drink, I decided to replace the lime juice with falernum, an iconic Tiki ingredient. My first iteration was a simple one to one replacement of falernum for lime juice. But you combine these ratios with lots of ice to make it smooth and you get a drink that is unrecognizably bland and sweet. Several iterations later, I found that the drink needed more gin, and the gin should be a London Dry, rather than in the New American style. Also, I added fresh lime juice back in, eventually reaching an equal measure with the falernum. Finally, I punched up the amount of bitters, and added orange bitters in as well. Combine all ingredients in blender with 16 oz. ice. Blend until very smooth. Serve in large cocktail glasses, garnished with two tattooed lime wedges skewered together with a cherry between. Serves two-plus. I’ll likely play with this some more, but for this year, I’m reasonably happy. It isn’t instantly recognizable as a Pegu descendant, but all the flavors are there and fairly balanced. I’d like to add more falernum, for the extra layer of exoticism it provides, but It would push things over to too sweet again. This formulation is a tranquil island presentation of the the Pegu’s flavors, with little of the imperially bracing punch of the original. Give it a try! Sounds like a tasty tipple as well, going to have to mix one up. The United States cannot tolerate a tattooed lime wedge gap!